The Regina 2014 North American Indigenous Games provided an entertaining and educational experience to attendees by producing a grassroots cultural festival that showcased North American Indigenous historical and cultural activities at the Cultural Village. Located on the lawn in front of the First Nations University of Canada, the event ran from July 21-26, 2014 from 11:00 am – 9:30 pm and was open and accessible to both athletes and the general public. The Cultural Village featured a Main Stage which showcased traditional / contemporary Indigenous entertainers, a Tipi Village housing interactive displays and demonstrations, a diverse showcase of artisan/ crafts, Indigenous food booths, gaming demonstrations, a VIP Area, a trade show, the Elder’s Program / Ceremonial Area and the Closing Ceremony. See below for a full map of the Village and Timetable for the Main Stage Performance Area! 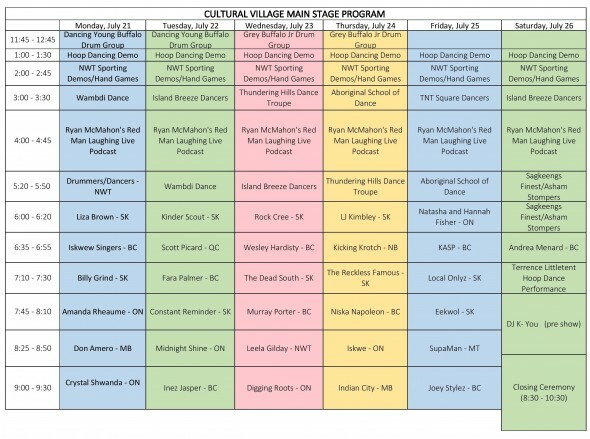 The following Tipi Workshops operated within the Cultural Village daily from 11am – 5pm (Monday July 21 to Saturday July 26th) and were completely free of charge to athletes and general public. Come and learn the deeper meaning behind each part of the Teepee as instructors share short stories and provide an explanation of the important and significance behind this widely recognized and important part of culture. A history of dance styles including origins, descriptions of regalia, traditions and protocols as well as dance lessons and performances throughout the day. Learn about indigenous lifestyles from across the border! Includes viewing plants for basket weaving, soapstone carving, shells, use of tools, storytelling, music from California and Pow wow dancing/singing. Metis history and artifacts on display, jigging (dance) demonstrations, Metis sash weaving, red river cart display, clothing, music, flags and language. Sweet Grass teachings will lead us back to our culture and more importantly back to ourselves. What will be shared is found deep within the teachings of our elders. These teachings will empower people to make positive changes in their lives. Connect with your inner self through singing and drumming. Learn the important history and take part in a wide variety of traditional songs while having the opportunity to hold and try your hand at drumming too! Come sit and spend time with our Elders, who will share with you a wonderful range of stories and history. Complete with ancient artifacts such as hand painted rock art known as pictographs/petroglyphs. Play a variety of fun hand games local to the Saskatchewan area and learn the history and importance behind them. Take part in a youth video storytelling workshop that will include a showreel of ‘Mispon: A celebration of indigenous film making’ work, along with film skill development such as shot types and interview techniques. Facilitators will discuss the values common in sports and treaties of how we must work together in both for success. Come share and discuss goals/aspirations while designing and building your very own Dreamcatcher! An interactive carving and painting experience where participants will learn about how to craft and develop bone carvings while being able to design and paint your own. Experience a wide variety of exciting cultural elements from the North! These include Satitu Dene Drummers, Drum Dances, Traditional Handgames as well as traditional game demos include high kicks, knee jumps, and stick pull and more! There’s a great storyteller in us all! Find out the tips and tricks to become a master storyteller in this fantastic writing & storytelling workshop. 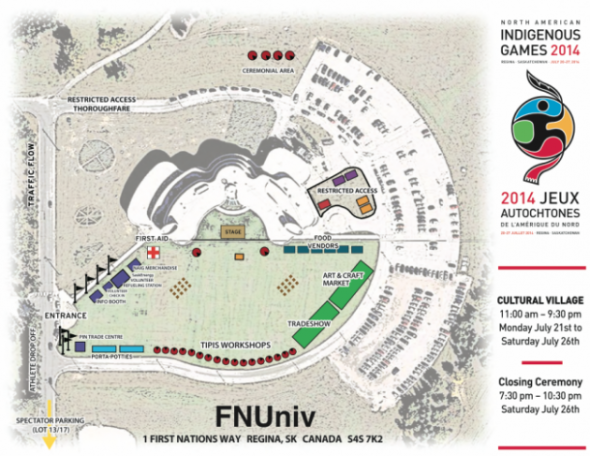 The Closing Ceremony took place at the location of the Cultural Village on the lawn of the First Nations University of Canada at 7:30 pm on Saturday, July 26. This Regina 2014 North American Indigenous Games ceremony was to celebrate the athletes’ achievements and to thank all the participants for visiting. Regina 2014 NAIG hosted a gala of cultural and contemporary entertainment that celebrated the success of the games, and provided an opportunity for the community at large to join in congratulating the athletes and thanking the volunteers for their participation in the games. The Games ended with a bang with a performance from 2014 Juno Award Winners – A Tribe Called Red.